The Justice Gap Appears to Be Getting Wider: How Are We Going to Deal With It? Darrel J. Papillion is a partner in the Baton Rouge firm of Walters, Papillion, Thomas, Cullens, L.L.C. He received a BA degree in 1990 from Louisiana State University and his JD degree in 1994 from LSU Paul M. Hebert Law Center. He was admitted to practice in Louisiana in 1994. Darrel served as president-elect of the Louisiana State Bar Association (LSBA). He served two terms on the LSBA’s Board of Governors as the Fifth District representative and as an at-large member. He co-chaired the LSBA’s Continuing Legal Education Committee (2009-16), chaired the Ethics Advisory Service Committee (2002-04) and was a member of the Federal Bench-Bar Liaison Committee (2000-06). He also served several terms in the House of Delegates. He received the 2005 LSBA Young Lawyers Section’s Hon. Michaelle Pitard Wynne Professionalism Award. 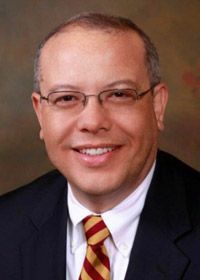 He is a member of the board of directors of the Louisiana Bar Foundation (2009-present). He was a member of the U.S. District Court Middle District of Louisiana Magistrate Selection Committee in 2013 and served as 2013-14 president of the Baton Rouge Bar Association. Darrel is AV-rated by Martindale-Hubbell and was recognized by Louisiana Super Lawyers (2008-present), Best Lawyers in America (2015-present) and the Baton Rouge Business Report’s Top 40 Under 40 (2006). In his community, he was the 2013-14 president of the Rotary Club of Baton Rouge. Darrel and his wife, Shirley, have been married for 25 years and are the parents of two children.